Lance Cpl. 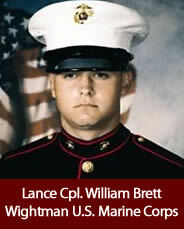 William Brett Wightman, age 22, of Sabina, Ohio; was assigned to the 3rd Battalion, 25th Marine Regiment, 4th Marine Division, Marine Forces Reserve, Columbus, Ohio; attached to Regimental Combat Team 2, 2nd Marine Division, II Marine Expeditionary Force (Forward). He was killed in action Aug. 3, 2005, when his amphibious assault vehicle was hit by an improvised explosive device during combat operations south of Hadithah, Iraq.